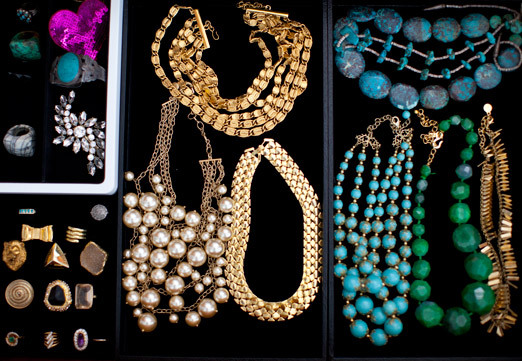 do you remember this messy mess, the jumble of jewelry and gems that sat on my dresser top as a constant reminder of my organization failure? IT’S GONE! if you’ve been following along on instagram (sarahyates) you’ve seen bits and pieces as i worked to replace it with my dream system- my favorite bracelets displayed on the dresser top with my watches. and two drawers containing the rest of my collection, tucked neatly away and organized well enough to make martha herself happy! and i finally framed a bunch of our wedding photos! when our bedroom is complete i’ll show you the whole shebang, including our final decision on the wallpaper. it will be the first (and only) room in the house that will be all done. we can’t wait! i found these black velvet display cases at the container store for my necklaces. and i edited. anything that didn’t feel entirely ME anymore- gone. just my most favorites made it into the drawers. i’m hoping this will also keep me in check with my consumerism- if i know i have to lose something that i have in order to bring something new into the collection i’ll think long and hard before making a purchase. these acrylic bracelet stands are from here, and the ring storage was from here (unfortunately it looks like the seller is out). i was worried that lou was going to fight me on the girliness of it, but let’s be honest it was such a major improvement from the old mess i think he was too happy to see it clean to complain! the dish i use to hold my watches was a white elephant gift exchange win. such luck that it works so perfectly for my watches! since those are in heavy rotation it’s great to have them so easily accessible. from left to right : marc jacobs, nixon, nixon. Looks great!! 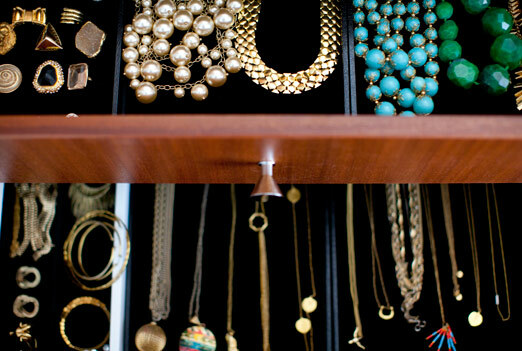 I did something similar–http://loulousucre.blogspot.com/2012/02/jewelry-organization-im-in-love.html. I would love to hear your thoughts. My question is about Secure Storage. But first, your post is simply beautiful! I'd like to find secure storage, but that is beautiful like yours. If by chance you have any suggestions, I have not been having any luck apart from the very expensive units or the ones that probably are not too effective! Thanks again for the great post! looks amazing! officially inspired to get my stuff figured out… thanks! How have I literally just found your blog?! Already obsessed. Your aesthetic is amazing! All your beautiful pieces so brilliantly displayed for easy access! "if" and that's a big if, I even had the luxury of space, I don't know that I could allow myself to actually do this. Upon your recommendation I ordered and have started to read "fix your brain change your life", because I too seem to think of the gloom. I would be afraid that if we were ever broken into, that the thief would have too easy and just pack up all of my perfectly curated baubles in one fell swoop! So for now everything I own will remain in any separate little boxes hidden and never worn! Pretty pathetic I know, but I am working on it! Thanks for the book recommend. Your collection looks amazing! Thank you for your kind thoughts about my laniebear. Still having a hard time. Miss her so much. Oh wow… it looks like every grils dream! Well done! thanks everyone! @ geri- i actually thought of that too, haha! but, i really try my hardest to not live in fear (which i really really struggle with) but i also try to live with as little attachment to THINGS as i can muster. yes, i love my jewelry, and i would be sad to lose it, but i do believe they're just things. and things can be replaced. maybe it's moving so often that has helped me with this…. sometimes i wish i could have NO things! 🙂 and sorry to hear you're still mourning laniebear. these things take a long time, and some hurts never really go away, they just get a little easier to live with. wishing you the best! This is so awesome! What a transformation! I have the same messy dresser of jewelry that you used to have. 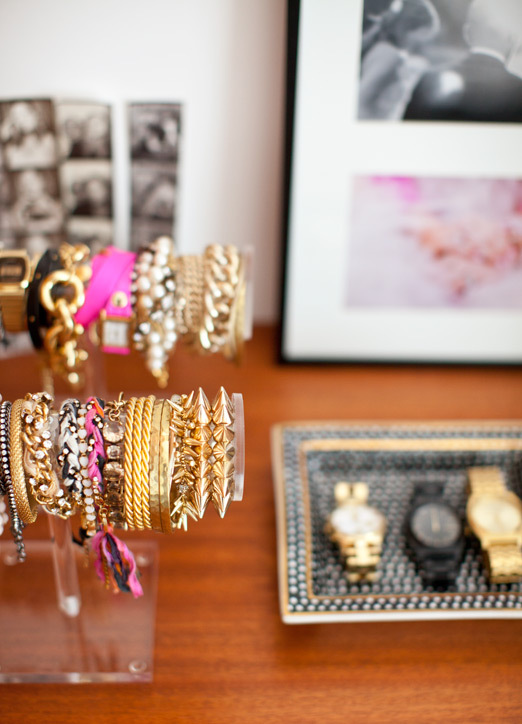 I am definitely buying some of those boxes and the bracelet stand. Thanks so much! that is super impressive. i need this kind of help desperately. Love this! I want that gold lion ring! I wish my house had the space for a display like this. Just adds that something extra to your jewelry and getting dressed in the morning. Ohhh I LOVE that lion ring! Great blog. Very inspirational. Time to organize my own jewelry jungle. Can you also share where that lovely jewelry is from? I love your taste! They have a ton of storage items, such as the lucite jewelry displays. I'm inspired! I don't have any extra luxury space either (as mentioned by another person), BUT I'm soooo inspired I'm going to get rid of clothes that I DON'T need and use the space for all my jewelry! I'm also going to go through my jewelry and only keep that which I absolutely love! Thanks for the posting! 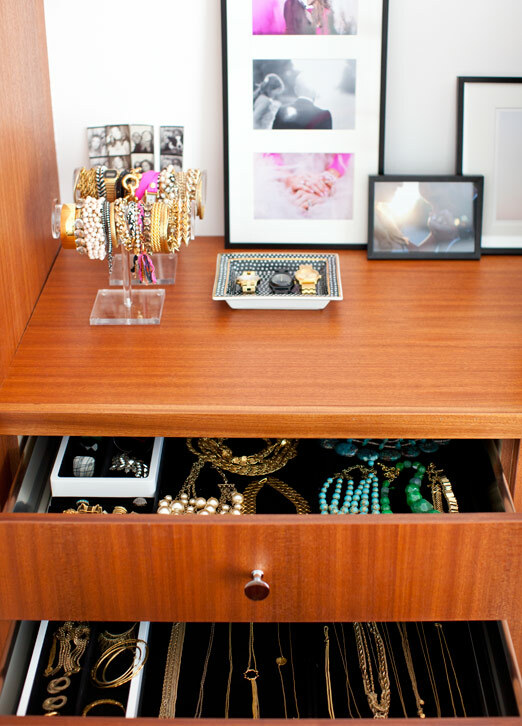 An entire dresser devoted to a jewelry collection? We swoon! 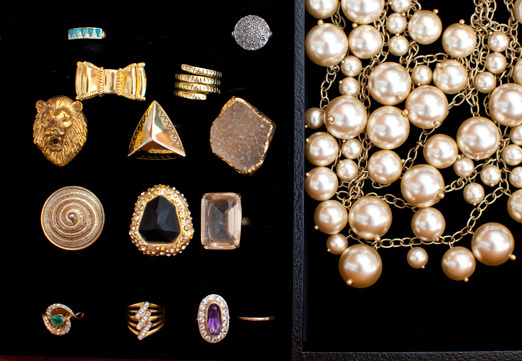 Love the carefully curated collection of baubles, you have an excellent eye for different eras, colors and textures! And it's tempting to let the mind wander to the worst case scenario (we're jewelers, we're constantly paranoid about security), but it's so much more rewarding to have the visual of your gorgeous collection at your finger tips, ready for perusal (and dress up!) When in doubt, insure, insure, insure. I love the acrylic bracelet stands, and your pictures are gorgeous – great colors and lighting! Thanks for sharing! I love it! I currently am working on my own jewelry collection, and your organization is a true inspiration as my own collection is growing! Thanks for sharing! Love this! 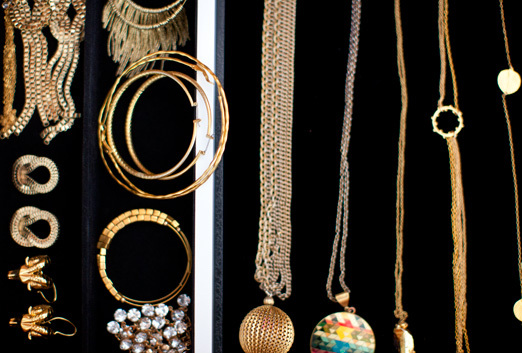 Organizing my jewelry is one of my favourite things to do! I LOVE THIS!! I'm immediately scouring eBay for acrylic bracelet holders like that (thnx for posting the link, they are sold out now but the 'name' is helpful for searching!). Ok, so the ring with the turquoise that you wore in your wedding photos! love it! tell me more! Hello! I really loved this post, thank you for sharing! 1. Which lacquer boxes did you purchase from container store? In your photo the white lacquer boxes look lined in black, but on the container store website they are not lined in black. 2. Where and how do you store your earrings? i am reading this impressive informative piece of writing here at my Һome. regularly. I’m quite certain I will learn a lot of new stuff right here! 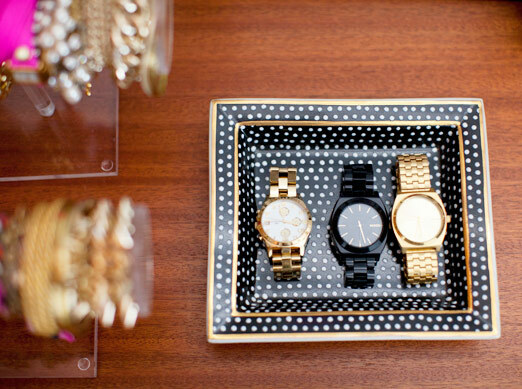 hi any idea where the black and white polka dot catchall tray with the watches is from?? Loving this look for jewlery, particularly love how you have the necklaces laid out length wise. Not only is it beautiful, but I imagine that this system keeps very organized over time; it looks very functional. Would you agree? Has it held up well since you’ve set this up? I’m having trouble finding similar black velvet display boxes. I realize its been a couple years since your post. These trays from the Container store look similar, except the velvet is gray. http://www.containerstore.com/shop/jewelryStorage/countertopVanity?productId=10029290&N=81047 Is this what you used in black?